Congressman Mike Honda has an inauspicious anniversary on the horizon. Just a little more than a year ago, the Office of Congressional Ethics (OCE) issued a report that cited “substantial reason to believe” the South Bay representative’s office abused House resources to keep him in office, and may have even traded official access and favors for campaign contributions. Both actions would likely constitute violations of federal law. Since that time there has been little movement in the ethics probe, as a referral to the House Committee on Ethics to continue investigating Honda’s office does not set any deadlines for announcements. Former Honda campaign manager Doug Greven, who the OCE labeled “a non-cooperating witness” when recommending he be compelled to testify via subpoena, had yet to be interviewed as of just a few months ago, parties tracking the investigation say. However, one source tells Metro that Greven has since been contacted to testify in the ethics probe. The former Honda campaign manager did not respond to interview requests. A concern amongst supporters of Ro Khanna—who is challenging Honda in a rematch of the 2014 election—is that congressional watchdogs are simply trying to run out the clock on the investigation. Khanna’s surprising June primary victory gives him an advantage going into November, and a $1.45 million war chest as of July is expected to propel him in the fall. If that’s the case, Honda’s ethics probe would then become moot, as there is little incentive to investigate a defeated congressman. Of the things Honda’s camp does well, transparency is not high on the list. Last week, the eight-term incumbent’s campaign began circulating a report to hand-picked reporters to write about Honda’s legal defense fund, which was created at the end of last year to help pay legal bills related to his ethics probe—total costs have exceeded $200,000. In a bureaucratic quirk, the report was due at the end of the last month but there is no requirement for the Legislative Resource Center, which is located in Washington, D.C. and provides documents strictly through in-person requests, to release the report for 30 days. Even after Honda’s operatives floated the documents for stories in the Los Angeles Times and Mercury News, with a caveat that they not publish the actual report, Honda’s camp refused to provide the documents to Metro, whose reporting sparked the initial investigation after a whistleblower came forward with internal emails. The two media reports about the defense fund stated that Honda paid his two law firms—Akin Gump Strauss Hauer & Feld and Miller & Chevalier—a total of $32,000 in the first half of this year. Honda relied on Bay Area businesses and a few specially tabbed supporters, dubbed “cranes” as part of a special fundraising strategy, to help him raise $36,950. The disclosure that Honda continues to spend time and money on a legal defense fund, after a report that noted little activity to begin the year, suggests the ethics probe has not yet run its course. If recent Honda campaign activity is taken into consideration, perhaps not any time soon. On the morning of July 31, Honda’s campaign sent out an email blast urgently requesting supporters to contribute before the Federal Elections Commission (FEC) deadline at the stroke of midnight. This would have been par for the course of almost every congressional campaign that touts its “grassroots” support, except for one detail: No FEC deadline falls on July 31. Rep. Mike Honda’s campaign refused to answer questions on an email that encouraged donations due to a nonexistent FEC deadline. Beckendorf refused to provide answers to follow-up questions such as: how the error was corrected; what the campaign means by a “subject line test;” why the message contained incorrect information in the body of the email, and not just the subject line; how many people received the email; how much money was raised on the false deadline day in question; and whether it planned to refund any money raised via the deceptive pitch. Vedant Patel, a spokesman for the Honda campaign, also sidestepped specific questions in an email by noting that “[f]undraising e-mails go through edits all the time on campaigns.” He then said “the real story” is Khanna’s donor support from Wall Street and wealthy conservatives. Previous reports have found that Honda and Khanna both receive support from upper-crust Republicans, but Honda’s campaign has a clear lead when it comes to playing fast and loose with the rules. The congressman’s own campaign website has routinely suggested that Honda has the support of President Obama and Vice President Joe Biden, despite the fact that both decided not to endorse him in this race as they did in 2014—before the OCE ethics investigation was launched. A YouTube video from 2014 remains on the website, and it includes the same image of Honda and Obama, suggesting he still has the support of the president. Beckendorf, Honda’s campaign manager, again did not respond to a request for comment. 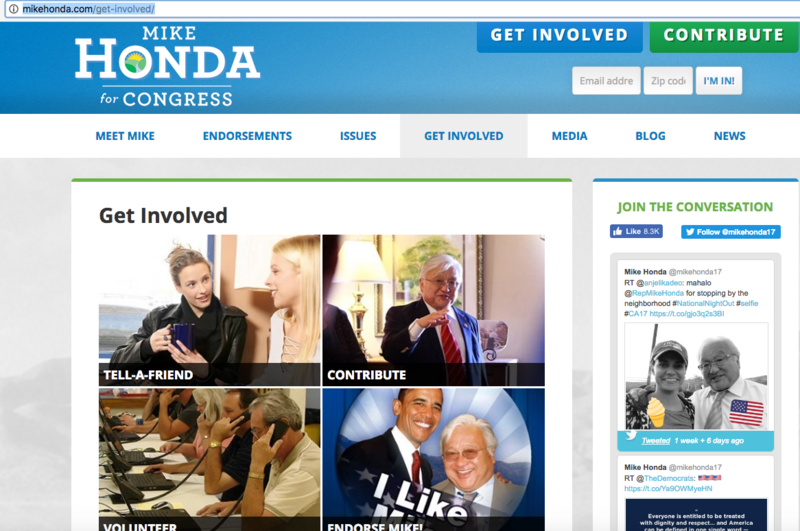 Rep. Mike Honda’s campaign continues to feature pictures and video that falsely suggest President Obama endorsed him in this election cycle. UPDATE: Within hours of this story going live, Rep. Mike Honda's campaign removed a photo that said President Obama endorsed his candidacy in the 2016 election cycle. A video suggesting as much remains on the site. UPDATE II: San Jose Inside spoke with Mercury News reporter Eric Kurhi, who said that the Honda campaign initially resisted providing the report without knowing the nature of the story to be written. Kurhi refused the terms and Honda’s spokesman eventually provided the report. Mike Honda’s primary election defeat to Ro Khanna almost certainly spells deuces for the congressman, and people are jumping ship. Rep. Mike Honda’s campaign spent $101,000 to defend against a House ethics investigation. And he may have manipulated the timing of certain bills. Democrats sparred this past weekend in San Jose, host of this year’s state party convention, and there was no shortage of shenanigans. Oh, gosh. Ahmad Rafah running for Santa Clara, boasts about how he was a key staffer for Mike Honda. Funded by Doug Greven and Patel. Rafah is planning to infect Santa Clara with this virus of corruption like mosquito. This is utterly ridiculous. An ethics investigation as a result of egregious and blatant misuse of his power, and he’s still in office. I want transparency and I don’t want my elected representative to get away with abusing their power when they leave office. Something’s gotta give. I’m shocked that Honda has yet to be held accountable for his actions. Such corruption explains why so many Americans are dissatisfied with Congress and its lack of efficiency. He has been our district’s representative for 16 years and it is time for a change. We finally have the opportunity to elect an honest and transparent representative to serve our community in Congress, and that is why I am supporting Ro Khanna instead. The lack of action in this investigation is exactly why we need change in Washington. As a constituent, I am fed up with politicians who think they can get away with anything. I am voting for Khanna in November because I want transparency and accountability from my representative, and you should too. The investigation is going to last until after the election. The “summer recess” for Congress ends September 6, with the session lasting until Septemeber 30. Congress is then out of session until the Novemeber election. The general inclination is to not do anything significant before the election. They aren’t going to call Honda to give his defense publicly in the narrow timeframe. Greven being called is a significant new fact for this investigation (as per normal, on this Honda ethics issue Josh Koehn is the only one reporting new information rather than gossiping or doing comms for the incumbent). Khanna wins, Honda gets eviscerated in the lame duck. Honda wins (seems unlikely but still possible), Honda probably gets censured. It was very very unwise to try to defend this to the max with “we did nothing wrong” and then try to personally attack sophisticated, well funded opponents rather than being accountable – only setting yourself up for the fall. Do you happen to know when Greven was called JK? Honda is a crook. Simple he has slept through hearings and an embarrassment to all of us who take the time to vote. Lie, stall, redirect, blame your opponent, it’s the congressional incumbent shuffle. Exactly why we need term limits on these guys. 8 years in office and off to jail you must GO! It seems to me that Mr. Honda is showing signs of desperation. He’s making up fake donation deadlines on his emails (one of which I received). He’s touting an endorsement from Barack Obama (who dropped his endorsement over a year ago). He’s downplaying the violations of his campaign staff. He’s mailing out brochures listing his “accomplishments”, and on the brochure cover, you’ll find the words, “Paid for at taxpayer expense”…that’s not where I want MY hard-earned money going! He’s increasing his number of town hall meetings and phone calls dramatically. But when it comes to communicating and being present, the one area he won’t make an appearance is in a debate with Ro Khanna! I wonder why…he’s afraid of looking like the lame duck candidate he is. It’s really time for a change, and that’s why I’m enthusiastically supporting Ro Khanna. Record in Silicon Valley Congressional races – Mike Honda 8-0 Ro Khanna 0-1 . The more intelligent constituents will vote for a “winner” with tenure & re-elect our beloved liberal Congressman Mike Honda ! If you want to be represented by an overly ambitious carpet-bagging “loser” with absolutely no experience in any elective office (local,regional,statewide or national) then ego-driven Congressional wannabee Ro Khanna is your obvious choice !! Be a wise winner & not a poor loser & Re-Elect Mike Honda !!! If you really think that Ro Khanna deserves the right to represent you,write in his name on your November ballot for a seat on the Union Sanitary District Board of Directors !!!! If you want to be represented by a desperate loser who lies about the contribution deadline to get more money; if you want to be represented by a lazy Go-fer who falls asleep during House sessions and has had only one bill passed in 16 years…to name a post office after a large donor; if you want to be represented by a man who lies by saying he is endorsed by Obama when he isn’t; if you want to be represented by a man who is endorsed by a moron like Frank Mockery…then by all means vote for Karaoke Mike Honda. I would appreciate your take on the Turkish situation. When you refer to the “Turkey coup”, are you referring to the actions by military groups against Erdegon, OR are you referring to the speculation that Erdegon instigated a “false flag” coup to justify a broad crackdown against his political enemies? He’s been in politics a long time. He stop serving the people long time ago and he’s as dirty as they come. The only thing good about Honda is the Honda car. Him, not so much. HERHOLD AND COHEN, SILICON VALLEY’S HOWLER MONKEYS! And the caps lock is the mark of a Tantrumista. You DO know, don’t you Blackie, that there is a difference between a “BLACK SMITH” and a “BLACKSMITH”. You wouldn’t be misrepresenting your blackness, would you, Mr. Smith? Do you and Rachel Dolezal belong to the same church? Have the impression that Honda and staff are not inherently crooked but just lazy. If there is a legal way to do things and a way to do the same thing that takes less effort but happens to be illegal, they will take the less effort route. He really is no longer suitable to represent this district. “TRUMPISTAS” DID I JUST MAKE FAMOUS A NEW TERM, FOR IDIOTS? Yes, it’s a term ^idiots^ use. Ro Kahana, bet on the wrong horses. The Silicon Valley Corps, that he was Championing, are about to be TAXED. Not in the 5%, he had offered, When getting support, so, A dead wrong candidate, to smear, and honorable man as Honda.. The H ! B Program, that he championed , is about to be dismantled. This site is a Rag! As ugly as it is political. Career politicians like Honda has been in politics forever and has mastered the art of getting away with unethical behavior. They have lost their desire to work for the people. Instead, they now work for themselves and their donors. Honda has lost his way.